Don’t just stand there, looking dejected. 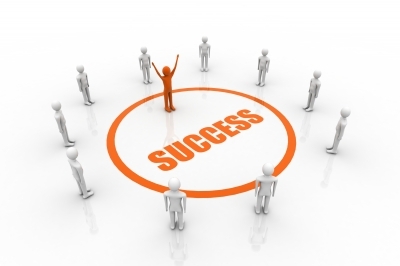 Take action now to join the circle of success! Have you been trying to join the circle of success, yet still remain outside of it? This article explains why some people cannot improve their life even after repeatedly using one or more of the popular self-improvement methods. This article is not meant to criticize the various success methods that are popular with the public. Instead, this article merely seeks to explain why some people, even after much effort in using these methods, are unable to improve their life. The following insights and methods result from revelations I have received, and my personal experiences in training my own subconscious mind. Since I am not a famous success guru, you may not believe me. That is perfectly natural. I merely suggest that if everything else has failed, you may want to try my insights and methods. I believe that popular self-improvement methods may not work for you because they tend to sugarcoat the facts. They may not want to reveal the painful truth. Success promoters want to be popular. That is how they can make money and try to help people solve their problems. I am different. I don’t especially want to be popular and I don’t care about getting rich. Therefore, I am willing to explain what may be causing your failures in life, even if these concepts expose me to ridicule. It is not easy to become successful. It takes time and effort. But I believe that anyone can improve their life if they are willing to try. Warning — the truth may only be fit for the bold and the brave. For others, it may be too painful to know. Your disappointments in adult life may be due to the limiting (false) beliefs you have accumulated over your life. These beliefs were meant to limit your exposure to danger when you were a child. However, since these limiting beliefs are hidden away in your subconscious mind, you may not even be aware of them. Okay, right about now you may want to kick me! Why do I say that you may harbor limiting beliefs? I say this because I want to help you. Because I know that my own subconscious mind is littered with limiting (false) beliefs. Besides, I know from my own experience that these limiting beliefs can be overridden by implanting empowering beliefs into your subconscious mind. It controls the various internal functions of your body, such as your digestive system. It allows you to be aware of your surroundings by interpreting your five senses. It assumes control over your physical actions when needed, such as when you are driving and are lost in thought. It stores all your attitudes, beliefs, experiences, habits, knowledge, rules of thumb, and skills in its memory. It uses these stored attitudes, beliefs, experiences, habits, knowledge, rules of thumb, and skills to interpret the meaning of the events in your life. It determines your automatic reactions to the events in your life. It largely determines what you can achieve, or even desire, in life. It requires massive activities for the subconscious mind to perform the above functions. These activities have to be concealed from your conscious mind, or it would be overwhelmed. As a consequence, you are unable to examine the beliefs that your subconscious mind uses to guide your adult life. Beliefs that were useful to guide your life as a child may be too limiting to guide your life as an adult. Yet, you may not be aware of this problem. The solution to this problem is to first determine if limiting beliefs are in control of your subconscious mind. If so, you need to replace them with empowering beliefs. Look around at your surroundings and your status in life. If they disappoint you, it probably is due to your limiting beliefs. In this case, you need to replace your limiting beliefs with empowering beliefs. You have to implant empowering beliefs into your subconscious mind to override the harmful effect of your limiting beliefs. Following are the two methods that have helped me improve myself and achieve my goals for retirement. I am confident and forceful. I enjoy completing a difficult project. I am a take-charge person. An affirmation is one or more phrases, such as the four above. Notice that each phrase shows you with this ability or attitude now, not at some time in the future. Say these phrases out loud with emphasis and strong emotion. Repeat these phrases several times each session. Perform each session two or three times a day. 2. Visualizations — These are guided daydreams. First, you would construct a scene for this daydream. Write it down so you can memorize it. It should show you actively using whatever attitudes or beliefs you want to implant into your subconscious mind. During this daydream, you also want to feel strong emotions of joy about having these new abilities. This visualization should show you having these abilities now, not sometime in the future. Now, perform the visualization. Close your eyes, see the scene play out in your mind, and feel the strong emotions of joy. Repeat this visualization two or three times a day for several weeks. By this time, you should begin to actually display these new abilities. After gaining these empowering abilities and attitudes, you should follow through with some appropriate action, such as choosing and completing a meaningful goal. Start with easy goals at first. Then you can gradually add more empowering beliefs and choose more difficult goals. This is how you achieve success in life. Regardless of circumstances, your subconscious mind is always available to help you. It contains a vast storehouse of knowledge. Good luck in your quest for a better life. For more details on this subject you may want to review and purchase some of my low-cost ebooks. Go to the My Kindle Books page on this blog to review them.